Hi, I'm Mella and I've adopted Allie, and the McMurphy Hotel and Fudge Shop. I'm a calico cat and not only are we good luck, but we are the sweetest, warmest kitty types. That's my story and I'm sticking to it. It's July and full on tourist season on Mackinac Island. I like the McMurphy hotel because it's on Main street and people come and go all the time. This means I get to meet a lot of interesting people. People watching and attention are my favorite things. The only downside to the McMurphy is the silly puppy. But I'm mature. I can carry my own with that creature. Allie likes to take us both out for picnics on the big lawn in front of the Fort, or back into one of the many parks in the state park areas. The best part about Mackinac is that there aren't any motor vehicles. That means a kitty never has to worry about getting run over...except maybe by some crazy bicyclist. I like to catch rides on the backs of the horse drawn wagons or sometimes I'll hop inside a carriage and go for a ride. People love me and let me. I know all the best parts of the island. The beaches are the best. Lot's of fish and things to play with. A cat like me never goes hungry in this paradise. At the end of every day I can go back to the McMurphy and sleep in Allie's bed. I understand they are shooting a television series on the island. I've made it my mission to get to know the film crew and worm my way into a shot or two. As I said, I'm good luck and sweet. There's no reason not to include me in the show. Unfortunately the star of the show thought Mal should be included as well. He seems to think the pup is better at finding dead bodies. Ha! I live to kill things...er...find dead things. I've got a few weeks to prove my point. In the meantime, I'll be enjoying picnics, beaches and the hustle and bustle of the season in full swing. Tell me what's your favorite part of July? Mella, I think you are adorably cute. You could come stay with me if you ever decide to take a vacation from the island. 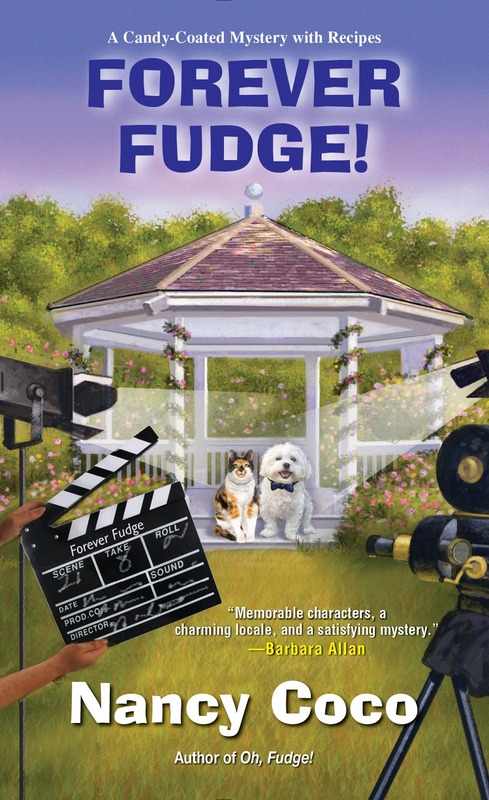 I can't wait to read all about your adventures in "Forever Fudge!" where I know you will be the star. I like the warmer weather of July (as long as it doesn't get too hot). My favorite part is that July is when I get to spend time with my brother & his family. He lives in PA and I live in MN.